Bee pollen is true gift from Mother Nature. It contains many essential nutrients. The Greeks called it the “nectar of the gods.” Bee pollen contains up to 35 percent complete protein, 22 amino acids, B vitamins, 27 mineral salts, trace elements and several enzymes. 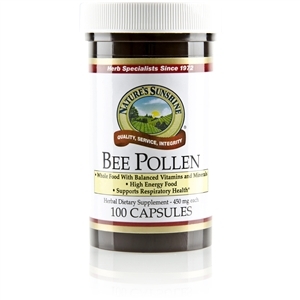 NSP Bee Pollen is naturally dried to preserve vital enzymes. Take 2 capsules with meals twice daily.